I think I am going to have to get stock in canned pumpkin. We have gone through quite a few cans of pumpkin for our yearly baking. We can’t get enough of the stuff. 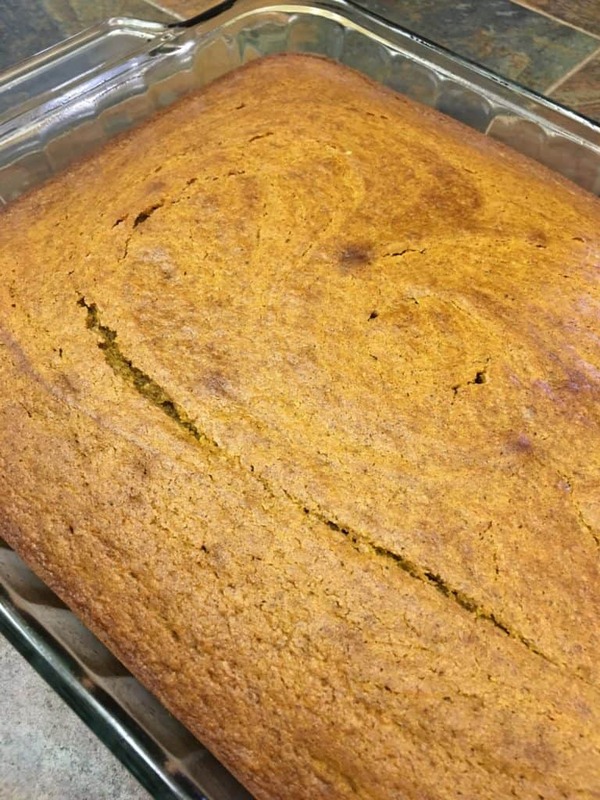 The minute my kids come through the door and smell the pumpkin, they head straight for the kitchen. 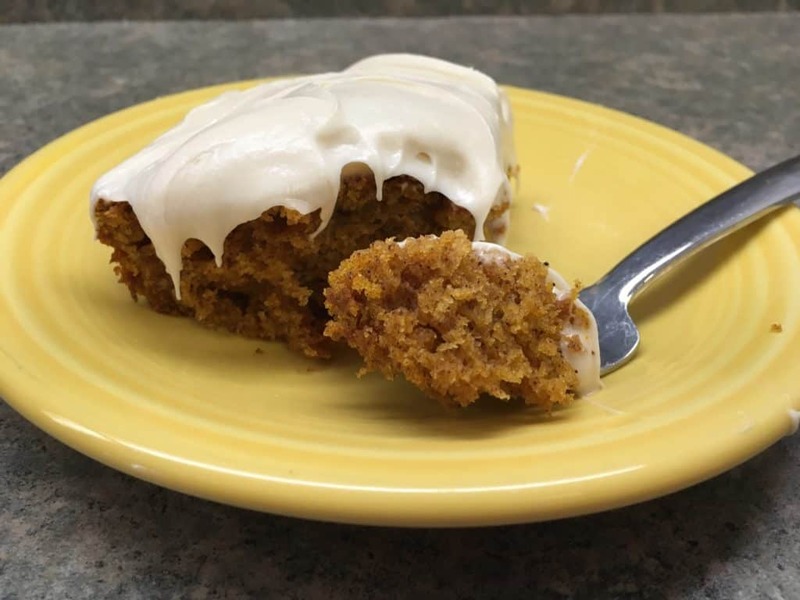 Pumpkin spice cake with cream cheese frosting was such an easy thing to fix, and it was even easier to devour. The cake is moist and eating the cream cheese frosting is like sending your taste buds to the planet of incredibly happy. 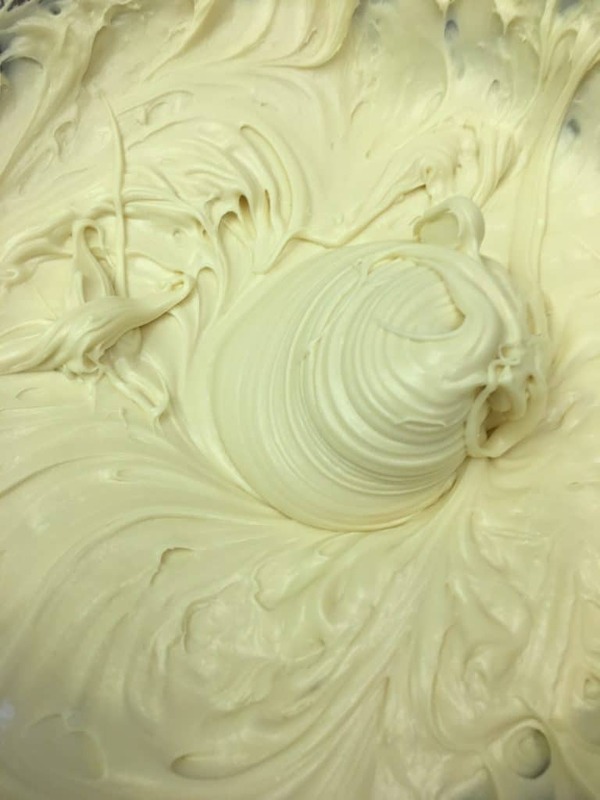 It reminds me of the frosting that my grandmother used to put on her angel food cakes. This frosting can go with just about any cake out there. After mixing the ingredients (in the recipe below), the cake cooked up so perfectly. I inserted a small cake tester to make sure it was cooked all the way through. I love my little cake tester because it doesn’t leave a larger hole like a knife does. You can easily get by with a knife, but the cake tester just makes it a little less obvious that you checked to make sure it was done. The frosting was by far my favorite thing to make, simply because the kids were at school and I had the beaters all to myself. Oh yeah. All mine. After the cake had cooled, I spread the frosting on top and knew the kids would be thrilled when they got home. I ate a piece, and it was pretty filling. It would make a great dessert to take to a potluck at church or a winter party. Your friends will love it and beg for the recipe. Feast your eyes on this gorgeous thing. Don’t you just want to climb inside the screen and take a bite? If you could, I’d invite you on over and share some of this treat. Since you can’t climb through the screen, you can do the next best thing and make the cake. Scroll down for the recipe and enjoy! Add the flour, sugar, spices, salt, baking powder, and baking soda into the mixer, and blend well. Add the eggs, canned pumpkin, and olive oil, and blend well. Stick cake tester in the middle to make sure it comes out clean. Add cream cheese and butter to the mixer and blend well. Add 1 cup of powdered sugar to the mixer and blend well. Continue adding the remaining sugar until well blended. Add the vanilla and blend. (If the frosting is a little clumpy, add 1 tsp. of milk, or more if needed). Looks moist and delicious! 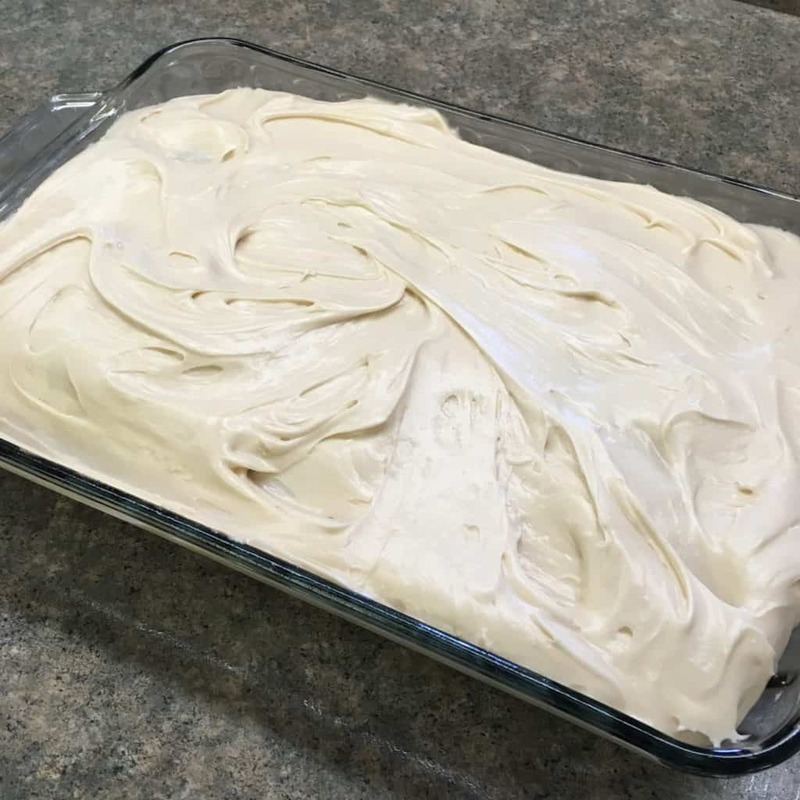 I love pumpkin spice cake with cream cheese frosting. Yum. Hi Joanne! It’s a delicious treat for sure! Thanks for stopping by! Looks delicious! What size is the tin of pumpkin? Hi Marie! I should update that with the exact amount. It’s a 15 oz. can. Thanks for stopping by!